Growing demand for faster access to larger volumes of data, coupled with emerging high-speed network standards and rapidly advancing technology, is having a profound impact on network infrastructure. 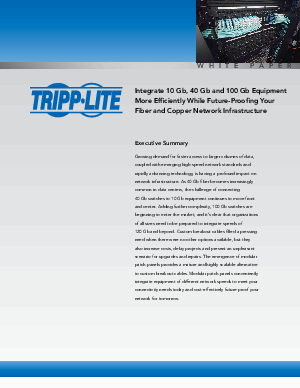 As 40 Gb fiber becomes increasingly common in data centers, the challenge of connecting 40 Gb switches to 10 Gb equipment continues to move front and center. Adding further complexity, 100 Gb switches are beginning to enter the market, and it’s clear that organizations of all sizes need to be prepared to integrate speeds of 120 Gb and beyond. Custom breakout cables filled a pressing need when there were no other options available, but they also increase costs, delay projects and present an unpleasant scenario for upgrades and repairs. The emergence of modular patch panels provides a mature and highly scalable alternative to custom breakout cables. Modular patch panels conveniently integrate equipment of different network speeds to meet your connectivity needs today and cost-effectively future-proof your network for tomorrow.